You fight of waves of attackers, warp somewhere to fight some more, then back again where of course you find yet more people trying to end your existence. 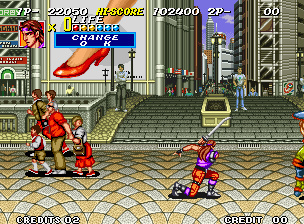 Along with the nifty ability to switch between characters during play, Sengoku 2 offers similar gameplay to the first title, but some tweaks have been made to offer a more enjoyable experience. Initially, however, the game seems a little more limited. 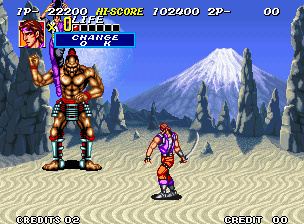 Whereas before your primary character would throw punches and kicks and gain weapons from orbs, here he permanently carries a blade (although there are now two attack buttons for high and low strikes). This gives some different looking options when attacking, but doesn’t make much of a difference to the game. Sometimes an attack may be blocked if you pick the wrong strike, but it’s a matter of timing rather than aim and you can simply attack again. Variety in attacks is instead provided by switching to a different character and this time around all four are available from the beginning. You get a minute of time with them before automatically reverting to the blade-slashing hero, but this is typically adequate for the task at hand. The abilities vary, with the staff-wielding fighter often being a good pick. The fighting dog looks good but is unsuitable for most situations and the ninja (with the typical ninja name of Mike Walsh) is fairly average but a good choice if you’ve collected an orb. Orbs provide our heroes more powerful and energy attacks which can allow you to keep your distance, as do the (always available) charged attacks. Charged attacks require you to hold down both attack buttons and the jump one while another combination is used to block. As awkward as this could be, HAMSTER has taken the sensible step of mapping these combinations to Switch’s Z buttons. Combat in the game is still fairly simple (there are no combos and a lot of one-hit enemies), but it is fast-paced and slicker than the first game - and it’s satisfying to quickly turn left and right taking out foes from each side. A good feature is the way weapons can lock together and you then look to get in a strike when they come apart again. Blocking moves can also be a good way to get a counter hit in, but as this won’t always work (and can be tricky to judge) it’s often simpler to just back away. Aside from walking left-to-right and fighting, the game also throws in a few sections on horseback. These are simple but enjoyable with your two attack buttons used (one for forward, one for backwards attacks) as you aim to decapitate the riders alongside you. In a good visual touch, one of these sections towards the end of the game shows in the background shots of a man hitting a taiko drum along to the music. There’s a good range of locations in the game with a few different time periods visited. Villages, desert areas, burning warzones and a fight atop an plane. There’s a good amount of detail in the surroundings, but there are some duff moments (static water) that lessens the impact. Various sound effects enhance the experience such as various swipes, clanging metal, yells and groans. There’s also a good scream from fleeing crowds when angry samurai warriors arrive in the relatively modern 199x setting. Music is also decent with a range of mysterious, intense and adventurous tracks throughout. 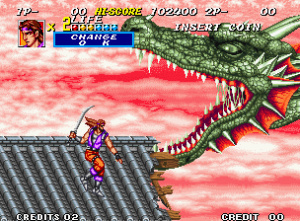 As the game progresses, tougher enemies increase in their number and it can be a challenge to take out the forces in front of you without getting hit from behind. Of course, as an ACA Neo Geo release, unlimited continues mean clearing the game will not be difficult and should you not want to push that continue button quite so often you can increase your stock of lives to 99 in the options menu. If you would like a challenge the usual one-credit Hi-score mode is available which as always also gives you an online leaderboard to try and improve your placement on. Two-player mode is available should you like to save the day with the help of a friend and the Caravan mode offers a different way to play as you try to score as highly as possible within the five minute time limit. Sure, you’re still slashing away at the same enemy forces but here a blocked attack has a greater impact due to the extra time taken delaying you moving onto the next set of attackers and more potential points. 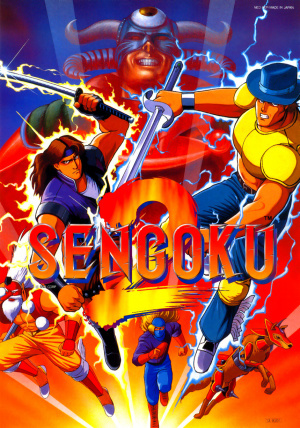 Sengoku 2 is quite similar to the first game in the series, but by upping the pace of combat it makes things a lot more enjoyable and making all characters available from the start gives you various options to consider from the get go. The move to two attacks buttons doesn't have much impact, but the simple horseback sections work surprisingly well. Like many of its ilk, the repetitive nature of the game will eventually lessen the desire to replay it, but the eShop is not short on retro offerings. Return to it after a while away (alone or with a friend) and Sengoku 2 will provide some decent sidescrolling slashing action. Really like this one and was surprised by how different it plays from the average beat-em-up. I really like the variety of locations, you never know what it's going to throw at you next. The graphics are lovely too. A nice alternative beat-em-up to have in your Switch collection. Can't wait for Sengoku 3,which looks to be even better. Playing these games with your stock lives and no continues is the best way to experience them. Adding lives and spamming the continues means you'll play it once and never go back to it. Defeats the purpose of what these kind of games are all about. Much like the shoot-em-up genre, you simply cannot have 'too many' beat-em-ups on the Switch IMO. Also really looking forward to SENGOKU 3. The graphics on that game look superb and it is the only one from the series I have never really had much experience with. Will rectify that when it hits the eShop in a week or so. Great graphics, great gameplay, lots of variety in enemies and locations, and far as I'm concerned, more than enough replayability and one of the best, if not THE best side scrolling beat em up on the Neo Geo. Easily a big, fat 8/10 in my book. Oh look, more Neo-Geo ports to fill the niche of the people who grew up with those games. Would be nice to get some retro content for the rest of us too. Either Nintendo, or a licensed 3rd party like Hamster. @FinalFrog I think I said the same thing nearly honestly. I don’t get why people complain about that either. I'm all over it. Can't wait for 3! This is a classic, probably my favorite in the series. @Heavyarms55 Very few people grew up with these games, at home. For most, this is the 1st time, they will own one of these, formerly super expensive, games, at home. @Heavyarms55 Well, this arcade port actually IS done by Hamster, which is also quite clearly mentioned in the review, so you get at least part of your wish. And I agree with @cerenzio: back then, both the console and the games were more or less completely unattainable for all but the richest or most spoiled kids. I remember cartridges costing as much as $100 - $150 a piece. And nowadays, the more rare games go well beyond the $500 - $700 mark, so it's great that we're still able to play them on modern systems this way. @ThanosReXXX In the UK Neo Geo games started from £200 ($280) back in the day and I recall seeing some games priced as high as £300.The console itself retailed for £400. Crazy money back then. Saying that some SNES games cost £70 ($98) ,Super Star Wars and Super Mario Allstars are two that come to mind. @ThanosReXXX The reason I mentioned Hamster is BECAUSE it was mentioned in the article. Clearly they are quite good at porting retro content and I wish they would do more than arcade ports and Neo-Geo stuff. Nintendo could license them to port things to Switch, I am sure Hamster would love a deal like that and it would save Nintendo time and resources. Sengoku 3 is the game I want. Sengoku 3 shames this game, as much as the shameful price goes on trying to get a MVS cart of #2. @samuelvictor I personally prefer 3 as it feels much smoother (and it is beautiful), but it did feel like a bit of a departure in style from the first two games. @ThanosReXXX @OorWullie Yup I can back up the consoles being £400 and games being £200+ in the UK. Absolutely insane, especially when you consider that before 1991 most UK games were on the Spectrum/Amstrad/C64 and playing £1.99 budget games, and by the mid 90s most had Amigas where most games were sub £20 and were HEAVILY pirated. One reason the NES never took here off was because they priced the games too high, at £50-60, whereas Master System games launched at £20-30. Of course older games would eventually go on sale for cheaper, but scouring through adverts in 90s game mags I don't remember seeing a (1st hand) MVS game for sub £100. NGCD games were £50 but the console was launched waaay too late (with PSX and Saturn already out on import) and no retailers stocked or pushed it. In any case: the most important thing I wanted to mention was that both the consoles and the games were simply FAR out of reach for most of us. @Heavyarms55 I wouldn't be so sure about that. HAMSTER already has more than enough titles to port and release for all platforms combined, so a deal with Nintendo, exclusive or not, wouldn't be all that beneficial to them, since they're not exactly starved for work as it is. And besides that, they're masters at porting arcade titles, although they also do console titles, but those aren't really their strength. And obviously, Neo Geo titles are also arcade titles, since the home versions were exactly the same as the ones in the arcade. That was also the whole gimmick/attraction behind the console: playing pixel perfect arcade titles at home. Also, these kinds of titles do not cost Nintendo time or resources, since all of them are outsourced. And even Nintendo's own retro titles cost them next to nothing to convert/port and release, if that was what you were talking about. Working on the ARM architecture of the Switch is far easier than the Wii or Wii U, so titles can be ported in a fraction of the time it took them to port them to their other systems. And often times it's just bundling a ROM with an emulator and a front end, which is even easier. Nintendo will probably use small teams of at most 10 to 15 man for jobs like these. Nintendo has well over 5000 employees, 95% of which are developers and programmers, so they'll have more than enough people left for their current gen roster. Happily, the system was one of the first that I remember discovering being properly emulated, and being amazed that I could finally play all the games at home. The AES is only western released console that I can think of that I have never owned or collected for, even when I was at my richest and spending huge amounts on other systems, I just couldn't justify the costs involved. That said, I did own a 3 slot MVS machine and quite a few carts before I sadly had to downsize. And indeed, he also got himself a Neo Geo, along with a bunch of games, so I did play some of them back then, but other than that, it was always no more than a dream of one day making enough money to own one for myself, but by the time I did, the system was already outdated and hard to come by, so I silently moved on, until my love for retro games once again grew, and the option for emulation became available. For those in the know, is this one of the better beat'em ups from the Neo Geo era that is available on the Switch? 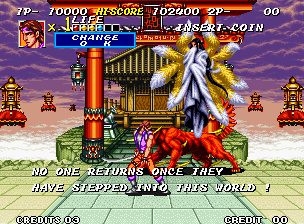 I haven't jumped in on any of the Neo Geo Games yet since it's been mostly fighting games and shmups which are genres I'm not fond of. Cool that you actually knew somebody with an AES, I never saw one in the wild, just read about them in magazines, although obviously MVS machines were prolific in arcades. @wratih9 Yes. If you are looking for scrolling beat'em ups (as opposed to 1 on 1 fighters) on NeoGeo this one is right up there. Sengoku 3 is possibly better, but both 2 & 3 are great. Mutation Nation is decent too. @wratih9 Yes it is. Actually, the entire trilogy is probably the best side scrolling beat em up you will find on the system, and with each following game, it got better and better, both graphics and gameplay-wise, so if you even remotely like side scrolling beat em ups, you will almost certainly like this series. And if you buy this one, be sure to be on the lookout for the third and final game in the series as well, which will probably also arrive on the Switch somewhere in the near future. @ThanosReXXX Haha yes. I recently bought a machine to convert my old VHS tapes (home movies I found whilst moving) to DVD/DivX and I'd forgotten just how much of a pain rewinding tapes is. It takes absolutely forever! I used to have a semi decent stereo at home with 2 tape drives, but for portable devices I only ever had the very cheap ones. Often thought of buying a device to rewind tapes on the go but figured it was another thing to carry! @samuelvictor Ah, that's too bad. Especially if some of the footage is stuff that is of personal importance to you or your loved ones. Probably goes without saying for a guy like you, but there's always the option of upscaling and/or cleaning up the image with dedicated software on a PC, but that can, at times, be quite the hassle, so it really does depend on how much you'd like to preserve some of that footage.